Surface Mount. Satin-finish stainless steel. 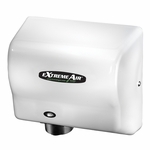 Automatic, dispenses universal 1-1/2" to 2" diameter core, up to 8" diameter, 8" wide, non-perforated, non-proprietary rolls.